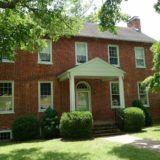 Historic 1820 home on 370 acre farm 6 minutes from Lexington. Panoramic views. Modern kitchen, bathrooms, AC, HDTV, washer/dryer. 2 BR, sleeps 6. $185/couple. $25/each additional person. $1,110/week. Children Welcome, WiFi, Smoke-Free Property, No Pets.